Excel Tasty Nuggets for Mature Rabbits is a tasty, complementary food with special ingredients to deal with some of the problems that age brings. It can be hard to see them slow down as they age so this diet has been specially formulated to help with joint stiffness, a lack of energy and weight management. Grass, Wheat, Soya Bean Hulls, Oat Bran, Barley, Peas, Unmolassed Beet Pulp, Yeast, Thyme, Ligno-Cellulose, Calcium Carbonate, Monocalcium Phosphate, Soya Oil, Fructo-oligosaccharides 0.4%, Ginseng, Salt, Vitamins and Minerals, Cranberry, Glucosamine hydrochloride, Palm Oil. Contains Natural Antioxidants. No artificial colours, flavours or preservatives. Feed your fibrevore an egg cup full of Excel Tasty Nuggets every day as part of The Excel Feeding Plan. 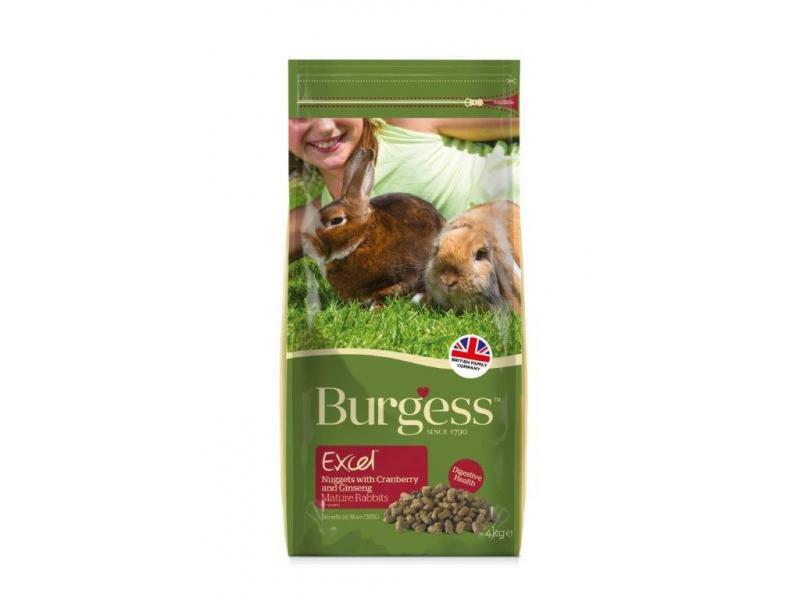 There are currently no questions for Burgess Excel Tasty Nuggets Mature Rabbit Food - be the first to ask one!